The historic village of Magnetawan, Algonquin for "swiftly flowing river" is located only 2 1/2 hours north of Toronto in the heart of Muskoka Parry Sound Cottage Country. The new bike trails are very popular addition to the region with several new routes being added as well as bike racks located at many businesses. Many weekends we see folks biking around our beautiful township. Founded over 150 years ago it is one of the oldest settlements in the Parry Sound district, being a major stop on the famous Nipissing colonization road through central Ontario. With great scenery, hiking & biking trails, camping and fishing it is natural destination to live & play. Located in the Parry Sound District, the township had a population of 1,454 in the 2011 Canadian census. There are many very popular waterways in the Muskoka Parry Sound Area including Ahmic Lake, Lake Cecebe, Horn Lake, Whitestone Lake, Manitouwabing, Big Doe, Little Doe, Pickerel, Bernard, Whalley, Neighick and Crawford. A very popular feature of the area is the local Farmer's Market which draws people from throughout the region. Every Saturday during the summer folks bring fresh baking, cheese, handmade crafts, woodworking and even kittens to give away! It's grown from a small gathering just a few years ago into one of the areas most popular attractions. The Magnetawan Real Estate market has been very robust once again with very stable pricing and a balanced market with the number of Homes and Cottages for sale in line with the number of Buyers. Ahmic Lake, Lake Cecebe, Horn Lake and Whitestone Lake are very popular but the demand for waterfront properties on smaller lakes remains strong. Vacant waterfront continues to sell well and there are many new cottages being built. There is a trend towards families purchacing cottage real estate for future retirement in the Magnetawan Area so year round road access is an important component to determining value. According to the Canadian Real Association the median home price for all of the Lakelands region was just over $250,000 in 2016 and the Magnetawan area runs just less than that. Cottages are generally start in the $ 300,000 to $400,000 range and can go well over $1,000,000.00. Recently we have seen many retirees moving into the area, a trend we are confident will continue. This is leading to cottages on year round roads and with good lake access being in very strong demand. Searching for a Magnetawan cottage? Click here for current listings. A.J. 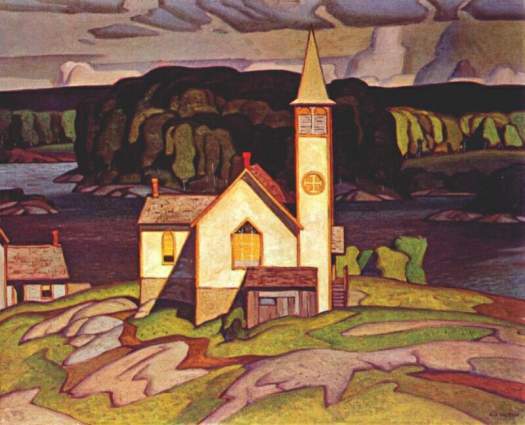 Cason's " The Church on the Rock"